The whole family can participate in the Race! Register your children as Kids Fun Run participants and they will receive kids-sized t-shirts and bibs. Child registration (ages 2 to 12) is $30. 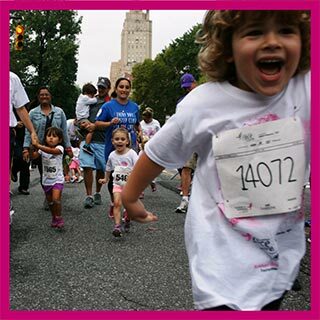 The Kids Fun Run provides children with a specially-designed race course to run with their peers. They can start off their day with the Fun Run before participating in the Race. Participants assemble near the Fun Run start line just north of the Race Start Line and the American Museum of Natural History's stairs. 3 to 6 year olds will run a quarter mile course from the Kids Start Line to 82nd Street and back. 7 to 9 year olds will run a half mile course from the Kids Start Line to 84th Street and back. 10 to 12 year olds will run a mile course from the Kids Start Line to 89th Street and back. Parents are welcome to run or walk along with their children. All Fun Run participants will receive a special prize for finishing along with light refreshments. After the Race, bring the children to the Kids Zone located in the Bandshell for fun designed especially for them.